It is no surprise that we know more about sunrooms, screen rooms and solariums than the next guy. It's what we've been doing everyday for 46 years. We don't expect you to know everything about choosing and designing a sunroom to meet your unique needs, but we want you to be able to understand enough to make a great decision. Below is a list of terms to help break down the technical stuff into more manageable bites. Patio Enclosures aluminum framed sunrooms are structurally sound and meet or surpass local and national building codes. Aluminum is one of the strongest materials available. It is resistant to temperature and humidity, so your frame will never rust, warp or rot, providing years of reliable use. Our aluminum frames are powder-coated which provides the highest resistance to fading, peeling or chipping. The anti lift bar, located in window and door handles in our three season room, prevents panels from being lifted or opened. Provides further security for you and your family. This glass tint has a warm bronze tint and provides your home with shading and UV protection while reducing solar heat gain, adding to your comfort. Comfort-Gard Plus High Performance Glass contains a soft-coat Low-E and argon gas. This makes it the most advanced glass available to maximize heating and cooling return. It keeps you warmer in the winter, reduces cooling costs by as much as 25% in the summer and saves your fabric by blocking UV rays 90% more effectively than ordinary glass. We custom cut all of our sunroom glass with our state-of-the-art Glass optimizer. This means your glass is cut to the exact specifications of your unique sunroom to the 1/8-inch. The solar energy collected from the sun (as heat) in a sunroom through windows, walls, skylights or other similar structures. Also known as "insulated sunroom glass". Comprised of two panes of glass, insulated glass is a popular choice for extending your seasonal use of your sunroom. It will also improve your heating and cooling performance. All our insulated sunroom glass units utilize Warm Edge Technology, a non conductive spacer separating the panes of glass. Warm edge spacers reduce condensation, increase insulating performance and improve energy savings. Patio Enclosures utilizes Super Spacer®, a structural non-metallic foam spacer which blocks the heat escape path and increases the overall efficiency of the insulating sunroom glass by as much as 30%. In fact, our insulated sunroom glass has passed the highest levels of testing by the American Society of Testing Materials and received ASTM 2190 certification. We maintain this certification through bi-annual quality control testing by the Insulating Glass Certification Council for durability and failure resistance. Eliminates the need for dead bolts and provides a secure way to ventilate your room while keeping children and pets safe. Top and bottom throw bolts provide maximum security. This features comes standard on our three season elite room, All season (four season) rooms and our solariums. The eave is the transition between the roof and the front panel. Since solariums have glass roof panels, we can customize the look of this transition. Learn more about solariums. Did you know that other sunroom companies may use only standard-size doors and windows, filling in with solid wall to fit your room? Because we cut and temper our own glass, you walls of glass are cut to fit your space exactly, providing maximum view and maximum ventilation. Our sunrooms are up to 98% glass. The result? A sunroom of wall-to-wall and floor-to-ceiling glass ... our Edge-to-Edge Advantage! Easily wire or cable your sunroom or screen enclosure with our optional sunroom electrical raceway. (Subject to local building codes). Save time and money when you decide to add interior or exterior electrical features into your sunroom. Simply install conveniences such as telephones, cables, fiber optics and speakers. Achieve a clean finished look as receptacles will fit flush into the sunroom or screen enclosure extrusions. ENERGY STAR Qualified is a trusted, government-backed classification for energy efficient products and services that help us save money and also protect the environment. Products earn this label by meeting a defined set of energy efficient requirements that are set forth in the ENERGY STAR product specifications. To learn more about these requirements, visit the ENERGY STAR website. These euro-style color-matched zinc door handles are available in the three season elite, all season (four season) rooms and solariums. These handles provide an easy grip for better operation as well as add a contemporary, sleek look. Patio Enclosures can custom build your sunroom right under your existing roof providing you the room you want in the space you already have. As long as it is structurally possible, we can do it. Use these rooms all year round, no matter where you live. Due to their thermally broken frame and insulated double-pane glass, you can heat and cool your room economically every day of the year. Learn more about our four season rooms. Also known as a pitched roof. A gable roof slopes downward in two parts at an angle from a central ridge. It forms a gable at each end. The ridge beam is typically perpendicular to the wall of the building to which the room is attached. Learn about Roofing Systems. Our exclusive 3' x 3' Comfort-Gard® glass roof panels are insulated windows that can be added to the roof of your room. Glass roof panels are a built-in part of your roof providing you with maximum flexibility in the quantity and position of these panels. Constructed of 1" thick tempered glass with Low-E and argon gas, your roof windows will add to the energy efficiency of your room. Double insulating cellular shades feature an energy-efficient, double honeycomb cell design that increases the energy efficiency of your home and helps reduce your energy bills. Comprised of two panes of glass, insulated glass is a popular choice for extending your seasonal use of your sunroom. It will also improve your heating and cooling performance. All our insulated sunroom glass units utilize Warm Edge Technology, a non conductive spacer separating the panes of glass. Warm edge spacers reduce condensation, increase insulating performance and improve energy savings. Patio Enclosures utilizes Super Spacer®, a structural non-metallic foam spacer which blocks the heat escape path and increases the overall efficiency of the insulating sunroom glass by as much as 30%. In fact, our insulated sunroom glass has passed the highest levels of testing by the American Society of Testing Materials and received ASTM 2190 certification. We maintain this certification through bi-annual quality control testing by the Insulating Glass Certification Council for durability and failure resistance. Patio Enclosures offers a lifetime limited warranty on every enclosure. This warranty covers all manufactured products including glass, roof panels, framing, seals and more. Our other products also carry exceptional warranties. See your design consultant for details regarding your warranty. Low emissivity. An object's ability to absorb and reflect heat and light energy. "High-E" objects like dark clothing absorb heat. "Low-E" objects like light clothing reflect heat and light. In terms of glass, Low-E is an ultra thin metal and compound coating applied to it. There are two types of Low-E coatings; hard-coat and soft-coat - both look and perform differently. Hard-coat Low-E is bonded to the glass so it is "hard" to remove. Soft-coat Low-E is "sputtered" on in a vaccuum and is delicate or "soft". Soft-coat Low-E has a higher R-value than Hard-coat. In other words, it has better insulating qualities. Patio covers are an option for customers looking for protection from the sun and the elements but don't want to enclosure their deck or patio. Our patio covers are constructed from the same material as our sunroom roofs, aluminum and insultated foam-core. They offer protection from the sun's rays and the elements. The measure of thermal resistance or the capacity of a material to impede heat flow. The higher the R-value, the greater the material's capacity to resist heat flow. R-values are commonly used in the building and construction industry. eShield™ radiant barriers reflect heat rather than absorb and hold it like regular insulation. Radiant barriers help keep the temperature of your home independent from the outside environment including sun, snow, wind, etc. Installed in your home's attic, radiant barriers help address all three types of energy transfer. This helps lower your utility bills and keep your family comfortable. Our exclusive railing system can be added to a Patio Enclosures screen room to provide extra safety and security. For any screen room above ground level, this option is a must-have especially if you have active children or pets. Made from extruded aluminum, one of the strongest materials available, a railing system will give you peace-of-mind and complies with all national and local building codes. Roller shades are sleek, clean and compact way to control the light in your sunroom. These shades block the sun's heat and glare. Roof pitch is a numerical measure of a roof's steepness. A roof's pitch is the measured vertical rise divided by the measured horizontal span. A pitch can also be called a roof's slope. Patio Enclosures will consider a roof's pitch when designing a custom sunroom. Our nearly-invisible aluminum screens enclose this room to give you maximum visibility. Enjoy flowing air and safety from bugs. Screen enclosures are perfect for balconies, porches and multi-floor buildings, townhouses and condominiums. We can always add glass for extended seasonal use. Learn more about our screen rooms. Standard glass for a three season sunroom. Single-pane glass is one single pane of glass. It provides protection from the elements and allows you to reap the benefits of solar heat gain (free heat from the sun). Depending on your location, single-pane glass is all you need to enjoy your sunroom. For extended seasonal use or year-round use of your room, you will want to consider double-pane insulated glass. Our screen rooms utilize easy to use locks in the screen handles which lock at a single point to provide security for your Patio Enclosures' screen room. One of the most popular and economical options, this roof has a single sloping surface. It's attached to the building's highest point off the roof slope. The pitch of a single-sloped roof varies depending on your individual needs. It is also known as a shed roof or studio roof. Learn about all of our sunroom roofing. The simple definition is a room completely made of glass from floor to ceiling. From top to bottom, Patio Enclosures solariums give you more view than any other sunroom because of its glass roof. Each solarium is designed with our energy-efficient 1" thick double-pane glass to improve heating and cooling performance. Solariums are available in a straight eave for its dramatic angles and height or a curved eave for a softer, more polished look. Solar shades provide superior shading for large windows and doors. Solar shades add function, style and efficiency to your home or business with the latest solar protection technology. These shades filter out up to 90% of the sun's negative effects, reduce solar heat gain and provide privacy. They are applied externally and fully retract into self-storing housing. A straight eave provides a sharp transition from the roof to the front panels. This design accomodates variations in pitch of the roof and allows Patio Enclosures solariums to fit in areas where others will not. Learn more about our solariums. Structural I-beams are a standard feature of each of our sunroom roofs. They provide strength to withstand snow loads of 30 lbs. per square foot and also provide a thermal barrier to reduce the transfer of heat or cold from the outside of the roof to the inside of the panel. Structurally engineered I-beams are the reason why Patio Enclosure's sunroom roofs are the strongest in the industry and also energy efficient. Our newest line of wood grain finishes for our solariums. The SunRealm™ collection offers the rich look of real wood with the strength, durability and weather resistance of aluminum. With an array of wood grain patterns and colors to choose from, your solarium is sure to coordinate with your existing decor. The simple definition is a room with glass walls. Patio Enclosures sunrooms are custom designed and manufactured to meet your needs. Our nearly invisible black-painted aluminum screens, standard in all of our enclosures, is better than traditional fiberglass. It provides maximum visibility and strength, stays cleaner and resists sagging. The rolling screen panels in our sunroom windows and doors are made from high-quality materials. Our unique design keeps our screen panels solidly in their tracks for dependable use. The design of our extra heavy duty, durable frames assure you years of virtually trouble-free operation with your sunroom windows and doors. Symphony Soprano Insulating Cellular Shades' double honeycomb cell design is energy-efficient, providing shade while reducing your home's energy bills. These cellular shades can be mounted on a flexible track and are ideal for curved eave solariums and skylights. Our TC 1000 Vent Fans can be added to a Patio Enclosures solarium to provide ventilation for your glass roof adding to your comfort. Ask your design consultant if adding vent fans would benefit your project. Tempered sunroom glass keeps you safe during accidental breakage. The glass will shatter into tiny pieces instead of dangerously sharp shards. We are proud to be the only sunroom glass manufacturer who performs this process in-house. This is our most popular sunroom type. Enjoy these rooms from spring through fall or longer if you reside in a warm climate. Depending on your planned use of the room, three season sunrooms are available with single-pane glass or 5/8" dual-sealed insulated glass. Patio Enclosures' vinyl framed sunrooms are reinforced with an inner frame of corrosion-resistant aluminum or steel creating a structurally sound enclosure that meets or surpasses local and national building codes. Vinyl is easy to clean and is less likely to show wear such as scratches and dents. *Available in our All Season Room only. 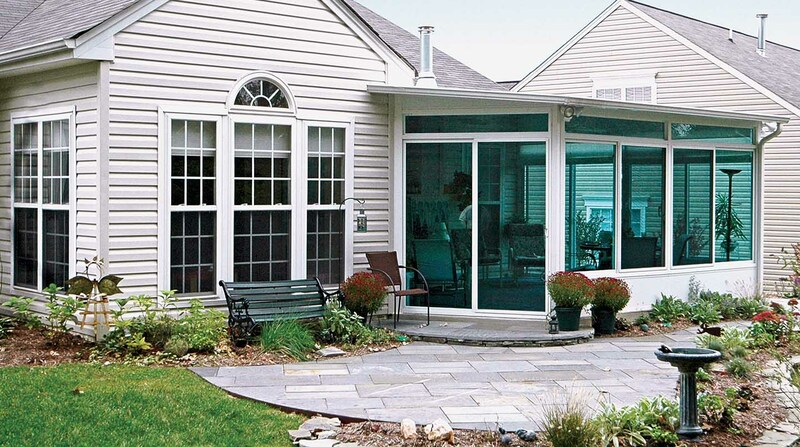 Patio Enclosures's weather stripping is a polypropylene barrier that is placed between aluminum or vinyl connections (windows and doors) that provide maximum draft protection and weather resistance. There are varying levels of weather stripping available depending on sunroom you choose. Screen rooms and three season rooms use polypropylene weather stripping. Three season elite rooms contain polypropylene stripping with a fin seal and all season rooms and solariums use a triple polypropylene stripping with a fin seal. The fin seal provides additional water protection. Patio Enclosures offers eShield Energy Reflective Glass Coating System (ERG), a revolutionary window film that will help lower energy costs. While traditional window film attempts to reduce heat gain by making your windows darker to absorb heat, eShield ERG utilizes state-of-the-art reflective technology in order to lower your home energy costs. It doesn't darken your windows and transmits 75 percent of visible light. Our new wood grain finish aluminum glazing bars provide a one-of-a-kind look for your solarium. Get the look of real wood with the durability of weather-resistant aluminum with this exclusive new finish. Patio Enclosures is the only sunroom manufacturer with this option. Ask your design consultant if this option is right for your project.